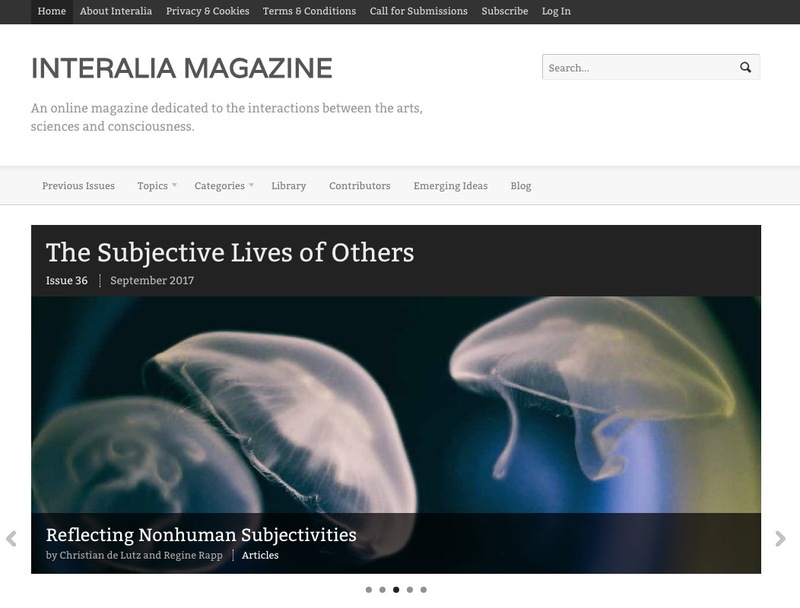 In collaboration with Richard Bright, I co-edited the September 2017 issue of Interalia magazine, The Subjective Lives of Others, exploring nonhuman subjectivity and different forms of interspecies critical thinking and creative practice. Interalia is an online magazine dedicated to the interactions between the arts, sciences and consciousness, which has been publishing stimulating writings and artworks since 2014. The following is a reproduction of my preface, introducing the issue’s themes and linking to individual contributions. In this issue of Interalia we explore the subjective lives of others, the nonhuman entities with which (or whom) we share our lives – whether we know it or not. Through artworks and essays, poems and sound works, we embrace the complex structures and functions of other living systems as diverse as bee hives, gorilla troops and ant colonies. We engage with the collective intelligence of micro-organisms such as bacteria and slime mould and find connections between these living systems and the techno/social networks within which our own subjectivities play out. Shifting between species and across scale, and connecting theory and practice, a range of disciplinary and interdisciplinary perspectives address the notion of nonhuman subjectivity from biology, mathematics, computation and sound, to art, curation, philosophy and pedagogy. Speculations on the ontology of the nonhuman – for we can never truly know the subjective experience of an other – take the form of cultural critique and interspecies relationships. Dominant themes presented include; social and collective behaviour of humans and nonhumans; interspecies ‘collaboration’ and co-creation; mechanisms for distributed intelligence; and emergent and adaptive systems in art and science. The contributions collectively explore the motivations and methods used by researchers and practitioners from diverse disciplines across the arts and sciences, who engage critically and creatively with nonhuman systems as material, model and metaphor. Some, who are working directly with biological material and living systems, tease out the negotiated territory of interspecies authorship, where human creativity is questionable and cooperation is key. Artists become caretakers for living ‘collaborators’, whose behaviour may be possible to predict but cannot be controlled. Modelling is discussed from diverse perspectives, exploring the underlying mechanisms and mathematical basis of biological and behavioural expression, identifying patterns between systems in order to gain greater insights and understanding of fundamental laws. Whether conceptual or physical, models allow for comparative cross/inter-species speculation and simulation, rules tested, applied and imagined. Questions are raised in philosophical discussion around how we relate to and co-habit with nonhuman life and how we make meaning of biosemiotic forms, through analogy and metaphor. To set the scene curators, Christian de Lutz and Regine Rapp reflect on their exhibition series exploring nonhuman subjectivity, a two year programme at Art Laboratory Berlin which comes to fruition in Autumn 2017. In Reflecting Nonhuman Subjectivities they contextualise their curatorial stance through the critical lens of ‘posthumanities’, examining recent developments in science/art and bioart practices. Much of the work focuses on the process of decentering, of engaging with ‘other-centric’ positions and connection is made between human creativity and nonhuman processes, whether mechanistic or intentional. The role of the artist operating between fields of knowledge production is discussed, as species and materials are combined to reveal and embody sensory perceptual worlds of the nonhuman, whether that be revealing the hidden microbial world within our bodies, hooking up to fungal mycelium communication networks, or engaging with the olfactory world of the dog. Lula Criado and Meritxell Rosell, co-editors of CLOT magazine, extend the discussion further On Interspecies Creativity through a revisiting and recontextualising of interviews conducted in recent years with practitioners co-creating with living organisms. Through the juxtaposition of practices, and through the words of the human agents orchestrating the creative production, many ethical considerations are drawn out in this negotiated space, exploring issues of control, authorship and agency. Presenting the works of artists, scholars and biologists as an interwoven trio of texts, Charissa Terranova, Meredith Tromble and Rachel Mayeri, present complementary works in written, visual and haptic form. Entangling Art & Biology: Three Serpentine Knots Of Indisciplined Practiceplayfully intersects notions of polymathy and in-betweenness: between science fiction and academic form, between human and nonhuman endeavour, between self and other. ‘Knitting together stories and images from the history of biology, the study of complex systems, new visualization and sensing technologies, and the integration of all of the above in works of contemporary art’ they explore interconnected territories with ‘metadisciplinary excitement’. In Becoming Non-human/Designing Non-human Oliver Kellhammer questions our definitions of intelligence through the perceptual world of the slime mould, Physarum polycephalum. Defined as the ‘poster organism’ for investigations into decentralised intelligence and ideas of extended body cognition we are lead through a series of biological entanglements and subjective realities as we are invited to inhabit the world of another form of consciousness. As an artist and teacher, Kellhammer mediates this territory though practical experiments allowing the slime mould to make decisions on his behalf, and through thought experiments, inviting his students to redesign urban spaces from a nonhuman perspective. As absurd oracle or speculative design tool, the slime mould offers the liberating opportunity to try to see the world from a different position. Another example of the extended body comes in the tentacled neuronally distributed form of the octopus, whose anatomy possesses a nervous system networked across its entire body. Here, film writer and film maker, Jasper Sharp, reviews Peter Godfrey-Smith’s book, Other Minds: The Octopus, the Sea, and the Deep Origins of Consciousness, contextualising the text in relation to film history, highlighting some cinematic star appearances from clever molluscs from documentary, drama and science fiction. Analogies compare the octopus’ mind to the construction of musical ensembles, comparing the control centres of a conductor-lead orchestra to a jazz improvisation group. Decentralised decision-making and distributed intelligence are further explored musically by composer and bee keeper Heloise Tunstall-Behrens in The Swarm: a choral exploration of honeybees. Her choral work, an all-female opera, interprets the complexities of the waggle dance ritual performed as honey bees establish new nest sites. Here the voices form the collective body – a superorganism of sound – which reveals complex behaviours of spatial organisation, cohesion and consensus through polyphonic singing. Kuai Shen examines socialisation, self-organisation and technological networks in Playing with ants & other insects, taking us on a tour of ant algorithms and avatars through the eclectic cultures of evolutionary biology, art history and video games. The techo/social rules of ‘ant mimicry’ are defined in terms of interrelatedness, the ant colony seen as an ‘empirical system’ of social interactions and communication networks – similar patterns emerge between the information traffic of harvester ants and that of Facebook users. Whether disguising pheromone scents in order to escape, mimicking sounds in order to get fed, or creating a distraction to affect a raid, mimicry becomes a sneaky tool utilised to secure evolutionary advantage. These masks are effective in both natural phenomena and ubiquitous in game-play systems. In Harnessing Slime Mould Communication for Musical Computing Eduardo R. Mirandadescribes his innovative work bringing new electronic components into musical composition. Biocomputer Rhythms is a performance between human composer and organic ‘memristor’, the slime mould Physarum polycephalum, mediated via a grand piano and a complex micro-electronic system. Performed in real time, oscillations are translated into waveforms through ‘a network of protoplasmic filaments that rhythmically contract and expand, producing shuttle streaming of intracellular contents’, a network that is resilient, efficient and self-healing. Simon Park exposes the complex social world of microscopic forms in Creative collaborations with invisible life, sharing key examples from an extensive repertoire of working with micro-organisms, developed over 30 years professional practice. Through his hybrid experimentation communities of bacteria, cryptozoa and infusoria are exposed to transformative environments, where varied conditions and elements reveal the hidden wonders of bacterial structure and behaviour. In vitro or in vivo, we are reminded of the importance of our own bacterial selves and the influence of bacterial balance on our moods and wellbeing. Zooming between the micro-scale of slime mould decentralisation and the human scale of the networked city, collective behaviour is explored through the varied processes and practices of the interdisciplinary team orchestrating Crowd Control, a situated participatory project which took place in Hackney Wick, East London in July 2017. Intentions, approaches and observations are shared through the accounts of participatory research and public experiments designed to creatively and critically explore how individuals operate within groups in response to environmental conditions. Further research into the mathematical modelling and analysis of biological systems is explored by Kit Yates in How many locusts does it take to start a biblical plague? Just three. Two contributions follow poetic formulae. The Other Country by Astrid Alben conjures up imagery of the coming together of elemental phenomena and tells tales of the interrelationships of relational habits, whilst Will Holloway’s False Consciousness forms a loose but tangible network between all manner of human and nonhuman systems, from machine learning, music and language to traffic, market forces and the question of free will in the crowd. As an interwoven poem of interconnected parts, it alludes to the conclusion that ‘the whole isn’t just the sum of (first order)… but is actively wiggling some of its parts’. This image may well hold true for this issue, as we invite the reader to piece together the individual parts to form their own collective whole. This issue is by no means meant as a definitive collection – there are a great many other artists, scientists, designers and thinkers exploring the territory of nonhuman subjectivity and collectivity. What we aim to provide is an associative and interconnected collection of thoughts, histories, ideas and practices, which allow the reader to build a perspective from multiple positions, one that challenges the dominant cultural definitions of intelligence hierarchies.